An age-old question, though we have not find any satisfying answer yet. This explanation is collected form a Science magazine, "Chickens, as a species, became chickens through a long, slow process of evolution. At some point, a chicken-like bird produced an offspring that, due to some mutation in its DNA, crossed the threshold from mere chicken likeness into chicken actuality. That is to say, a proto-chicken gave birth to a real-life official chicken. 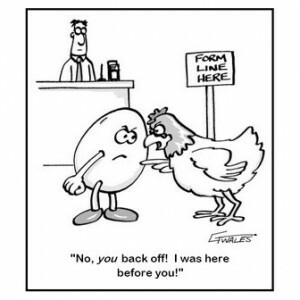 And since that real-life official chicken came out of its own egg, we can say that the egg came first.". Please join the conversation and let us know what do you think about this vital question.